that Google was about to punish sites that relied on social bookmarking to build links. Matt Cutts and other Google employees quickly explained that the rumours were false but the issue raised some interesting points. “I would not worry too much about a blog post that doesn’t seem to exist. That said, keep in mind that PageRank is roughly based on the quantity and quality of the links pointing to a page. Traffic from self-created bookmarks does not really play a role in that, at least not directly. The key is that Google wants to count natural links that are editorially given. It doesn’t want to count links that site owners create themselves. If you bookmark your site on Digg or del.icio.us and you are the only person that votes for it then there is no reason the link should help you. 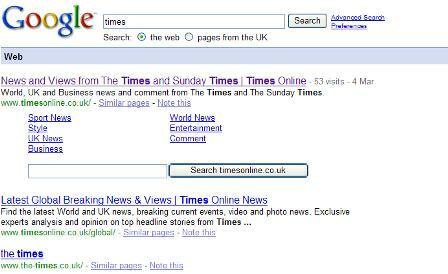 Ideally Google would only count links that became popular or even discount all social bookmarking links altogether. My takeaway from this is that social bookmarking is a means to get links from blogs – you shouldn’t be relying on links from the bookmarking sites themselves. Just how much of the customer journey will Google own? Google’s stated mission is to “organize the world’s information and make it universally accessible and useful”. The genius of this statement is that it sounds quite innocuous, indeed philanthropic, despite its obvious grand ambition, but actually allows pretty much anything within its scope. It is interesting to see just how much of the online customer journey (from search, to research, to purchase) Google is taking hold of. Will we all end up as “wholesalers” to Google’s customers?